There are a number of nutrient deficiencies associated with Celiac and other autoimmune disorders. These occur not only BEFORE diagnosis, due to flattened villi and malabsorption, but AFTER diagnosis as well. It’s up to us to choose healthy, naturally gluten-free foods (like fruits, veggies, lean protein and brown rice) in order to feel the best we can. Even then, we may still have deficiencies. I was diagnosed about 5 years ago. Although I have experienced dramatic improvements in my health, sleep quality, and energy level, I have still been dealing with some “weird” symptoms that I wasn’t sure were going to go away. These include eye floaters (which I’ve noticed for about 2 years now), shakiness and rapid pulse especially during the first half of the day, and carbohydrate intolerance. (Eating high carb meals have been giving me headaches). So…. 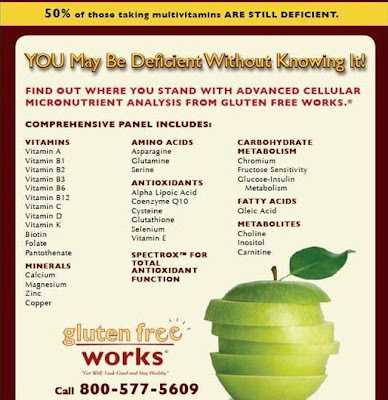 I was VERY excited when I heard that Gluten Free Works was going to be offering NUTRITION TESTING. I couldn’t wait to try it out. If you are still dealing with troubling symptoms, I would HIGHLY recommend looking into this test. It is done by the PhD’s at SpectraCell Laboratories. They have been around since 1993, and use the most advanced technology in nutrient testing. This particular test tests your WHITE blood cells. Most tests you get from your regular doctor test your red blood cells. The white blood cell tests give you a much more accurate view of your long term nutrient status. You can have vitamins “floating around” in your red blood cells but you will still be deficient, and for this reason, your regular doctor may miss diagnosing you with a key vitamin deficiency. I am still amazed that my GI doctor never mentioned anything about this when I was first diagnosed. More doctors need to be aware that this kind of testing is out there! Here’s WHAT TO EXPECT. It’s pretty simple. You get a packet in the mail, take it to a draw site, and then drop off your blood samples to a FedEx. You should have your results within 2-3 weeks! I will keep you posted on my progress. I plan to re-test in about 6 months to make sure my deficiencies have been corrected. Please let me know if you have any questions about this test, and how it works for you. I promise you that it will change your life for the better! :) Don’t put off feeling great for another day….go get tested! How much does it cost? Insurance cover any of it?